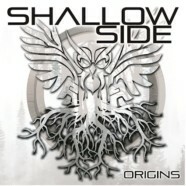 Shallow Side are a band that, even though they’re just emerging and getting going, they’re doing everything right. Not long ago, they released an EP- One, which featured a cover of Styx classic “Renegade,” which caught the attention of the legendary band’s guitarist Tommy Shaw. Now, they’ve released Origins, which is more impressive than it’s short predecessor and it’s not even the band’s official full-length debut- it’s yet another appetizer and it’s a juicy one at that. Throw in the fact that they’re one of the hardest-traveling bands in all of music- not just rock- and it’s a recipe for success. “Crutch” starts the record with a dark, ominous, groovy guitar intro, which leads into an angst-filled emotional cry for mercy. It starts the album off strong and is a song you can relate to easily and Shallow Side talk candidly about the confusion and anger of a bad relationship ending. “Rebel” is the definition of badass. With a line like “Brush my teeth with cocaine, this ain’t my first rodeo. Wash it down with whiskey, dressed in black from head to toe,” you’re hooked just two songs in. “Crazy” slows the record down perfectly and is one of the most beautiful power ballads of the year. This song talks about being gone so much that you miss the person you’re with can’t handle being without them. The buildup and climax gives you goosebumps and is an anthem. “Can You Hear Me” is a Black Stone Cherry/southern rock-fueled rock track that makes you move, dance and go crazy. It’s a party from start to finish. “Try To Fight It” features an eerie, haunting intro that makes you think of driving down a dark, desolate road before the song rips into a slow, emotionally-charged rock track. “Stand Up” is just guitar riff heaven. This is one of the standout tracks of the album, which says a lot and is also the song where Shallow Side show how strong they really are. The united backup vocals on the chorus will give you chills. When you imagine this song live, you just get excited. “Home Today” is a simple track but the guitar and vocals help bring out the intimate and personal content of the lyrics. Even when the song picks up toward the end, they keep it acoustic and it really adds to the feeling of the song. The record wraps up with “Try To Fight It Acoustic,” which is almost better than the full version and gives a full circle perspective of the song as well as “Out Of Reach Acoustic,” which is just plain beautiful and you really feel the lyrics of the track on every level. In the end, Shallow Side are doing everything they can to become a household name in the world of rock and to reach headline status. If their upcoming full-length debut- Saints & Sinners is anything like One and Origins, there’s no stopping Shallow Side.